This past week, I was fortunate enough to spend time working on a smallholders dairy project in Naari, Meru County. Farmers helping Farmers, the Prince Edward Island NGO that started working with the Mukurweini dairy nearly 20 years ago, also works with other co-operative dairies in Kenya. VWB-Canada partners with Farmers Helping Farmers to offer veterinary and other services to their partner dairies. 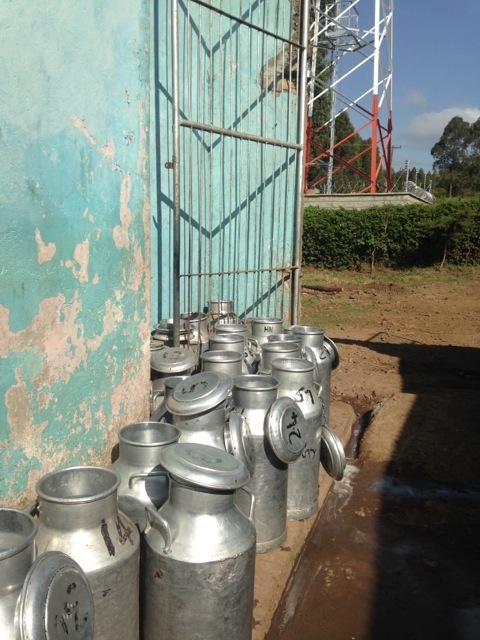 Due to the success of the Mukurweini dairy, Farmers helping Farmers is now working alongside new and developing dairies throughout the Mount Kenya area to provide valuable knowledge and support so that these dairy co-operatives can grow in a sustainable and profitable manner. The Naari dairy has recently partnered with Farmers and Helping Farmers, and this summer, several Canadian veterinary students and Kenyan veterinarians are conducting research on cow nutrition and health as part of a baseline survey in this area. My visit to Naari was a wonderful opportunity for me to gain exposure to smallholder dairy farms in another area, and for me to appreciate the opportunities for development of the smallholder dairy farming in Kenya. And both Maggie and Sarifa will also be visiting Naari as well! So I packed my bags and off I went to the other side of Mount Kenya. Visiting Naari and the Meru area was an eye opener for me for a number of reasons. Meru may only be about three hours away from Mukurweini by car but the landscape changes drastically from tropical and extremely hilly to flat and arid. Accompanying these geographic differences is a change in the way cattle are farmed. There are more beef cows in Meru and dairy cows are often found grazing in fields rather than being zero-grazed (where food is cut and brought to the cows in their pens). This presents different challenges and benefits for the farmers. For example, grazed cows are more likely to acquire ticks harbouring diseases, and farmers must dip or spray their cattle with acaricide, a chemical that kills ticks, much more than zero-grazed cattle. However, the benefit of Meru’s flat and less populous landscape means that farmers may be able to graze their cattle along roadsides and in pastures more, thus reducing the work of having to harvest and carry forage for their animals. But in both Naari and Mukurweini, cattle are a very important source of income and pride for farmers. The Naari dairy is what I imagine the Mukurweini dairy must have been like 20 years ago. It is hard to paint a picture of the two dairies, but I will compare and contrast them to give a sense of their differences. The Naari dairy was started in 2010 after a ten-year hiatus when the co-operative fell apart. Now, the dairy is under new management and the growing success of this dairy is attracting more farmers and investment. The Naari dairy has seven employees and has a bulk tank where milk is stored before being shipped to Meru as milk is not processed nor sold at the Naari dairy. There are 500 farmers that supply milk to the dairy and milk cans are collected each day by several donkey carts and motor bikes. By contrast, the Mukurweini dairy has 6,500 farmers supplying milk to the dairy. Milk is collected by trucks at collection points before being processed on site and then sold on to Nairobi. The Mukurweini dairy might currently be larger and more developed than the dairy in Naari, but they both started in the same place; thirty years ago, the Mukurweini sold only 32 litres on its’ first day in business! The possibility of improvement and development of the dairy industry in Naari and other smallholder dairy farming regions in Kenya is tremendously exciting. Having a good dairy co-operative is extremely important for smallholder dairy farmers, as a well-functioning co-operative dairy can provide loans, veterinary services, and farming education to its’ members. By learning from the successes and challenges in developing the dairy in Mukurweini, Farmers helping Farmers (and future Veterinarians without Borders interns), can transfer this knowledge to new areas like Naari and continue to research best farming practices that benefit both farmers and their animals. P.s. On a fun note, we have noticed some interesting trends in cow names. A very popular name for cows in Mukurweini is ‘Meni.’ I would hazard that at least 85% of cows here are called Meni (we even met a Meni Junior!). In the Meru area, cows are often called ‘Matune’, meaning brown, or ‘Kairo’, meaning black. Occasionally, cows are given names that are also given to women. I met several cows named Mawdu-ay, meaning ‘beautiful lady’ in the local language.